Here at Bourne Car & Van Hire, we are delighted to offer wheel alignment and tracking. Wheel alignment can be referred to as tracking and is all part of the standard maintenance for your vehicle which involves the correcting of the angles on your wheel to ensure they are parallel to one another and are at a 90-degree angle to the ground. We can offer you a choice of wheel alignment options to that offer the best value solution for your vehicle. Whether it be a toe alignment, camber, or caster alignment we can assist. Are you aware of the different types of wheel alignments? This covers the front end but also ensures that all four wheels of the vehicle are entirely square with one another. The thrust is recommended for cars with a stable rear suspension and produces significant results ensuring longer lasting tyre wear as well as enhanced fuel economy. This is suitable for vehicles with four-wheel independent suspensions as well as front wheel drives. This alignment combines all the components of a front and thrust but also ensures the correct positioning of the rear axle angles. 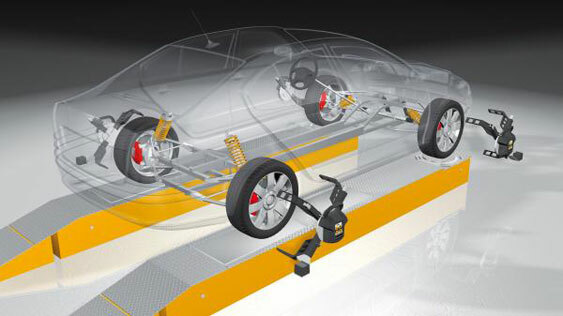 This is to ensure that all of your tyres angles are in line with the centre of your vehicle. The opposite of this term is a ‘toe out’ as the correct toe position will slightly vary depending on its suspension or it is a front wheel, rear wheel or an all-wheel drive. The camber, caster, and toe angles are present on every wheel, and when these are aligned correctly, it enables the vehicle to drive straight. When the camber, caster and toe angles are misaligned, it will cause you to experience wheel alignment problems such as your vehicle pulling to the one side or causing uneven tyre wear. If these angles are all correct, then this will ensure your tyres, steering and vehicle drive straight and even. Have you ever wondered why your vehicle requires a wheel alignment? The fundamental purpose is to reduce the tyre wear and to ensure that your vehicle travels straight without pulling to one side. A vehicle's wheels can go out of alignment with everyday driving. However, bumps and knocks which usually occur from the car making contact with something like a pothole can have a direct impact on the vehicles tracking as well as if you have had a road traffic accident. Sometimes you may not even be immediately aware, but other times you will most definitely feel your vehicle pulling to the one side which has an impact on your vehicles fuel economy as well as your tyre wear and deeper wear on your suspension components. Even if you do not experience any of these things, we strongly recommend that you have your wheel alignment checked with us on an annual basis. As with all wheel alignment testing, we strongly urge that you are carrying a ‘normal’ load during the test so if you are a tradesperson we will recommend you to remove all heavy tools, etc. Once your wheel alignment test has been completed, you will be given a printout outlining your vehicles wheel angles before and after the alignment. The safety of our customers is paramount so why not book in with us today here at Bourne Car & Van Hire, and we will carry out a comprehensive test at a price affordable to you.